Lately, it seems there is a movement towards downsizing our living spaces. I have experienced that myself, moving from a 3200 sq foot home, into a 1000 sq foot condominium. 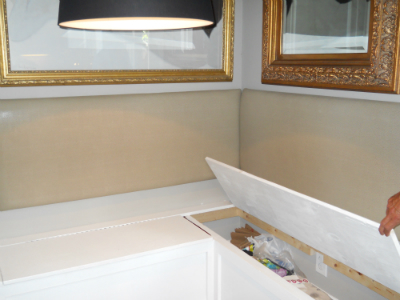 One thing I found, was I had little storage, BIG pieces of furniture, and a very small footprint in my dining area. 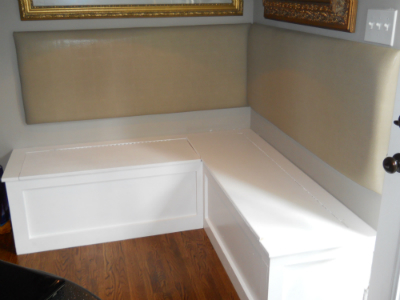 I decided to do built-in seating, which would provide me a generous amount of seating and storage.Budget being small, I checked out great little fabric shop that specializes in high end fabric remnants, at a very reasonable price, Modern Fabrics located in the Dilworth Neighborhood here in Charlotte.Hunting for a small table, I happened upon a fantastic deal at the Pottery Barn outlet in Gaffney South Carolina. A stone outdoor table. Perfect, at a fraction of the original cost! Now, time to get to work.. 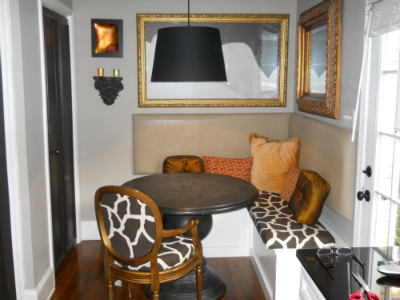 I painted the walls a soft light grey, upholstered the seats in a wonderful chocolate and white giraffe print. Back is upholstered in a light grey snakeskin vinyl and did some throw pillows in a wonderful orange contemporary fabric. I also had a small side chair with an oval back that I recovered myself in a coordinating fabric that I happened to like. The end result is a cozy, eclectic, well tailored dining area that seats 5 comfortably, with a plethora of storage underneath, as I do like to buy my soft drinks in bulk. I am finding you can live graciously in a smaller space. Very cool. When we moved from NC to Ohio a year and a half ago, we went from 2,100 sq feet to 1,300. Not as drastic as yours, but still a challenge with storage!! Love the dining room idea!! No, I did not notice the cushions nailed to the wall..now I have. Thanks for checking us out Tami. Stay tuned as we have so much more coming! The dining area was alot of fun to do. I love this–looks great! My house Is looking tired. Think I need some “Chabulous” here? Thanks Terri!! Appreciate your feedback! Loading lots of great content everyday. Please come backand visit us again!! I’m proud of you Stephen!!!!! Who would have “THUNK”!! I espcially like the look on your face as you reached into the hot oven for your crust… I would have dropped it and said a few choice words…. Thanks Phil! Yes I can post a link to your business.